Limburg is that weird piece of the Netherlands that is jutting out between Belgium and Germany. Most Dutch people consider Limburg to be far away and a kind of different, perhaps because of the dialect spoken in this Dutch province – the Limburgish. The main city in Limburg is Maastricht and most tourists coming to the Netherlands limit their visit only to Maastricht. However, there are so many beautiful places near Maastricht – from cute little villages, to lovely cities, stunning castles and amazing nature parks, including three national parks. In this post you will find a selection of places that can be visited on a day trip from Maastricht. 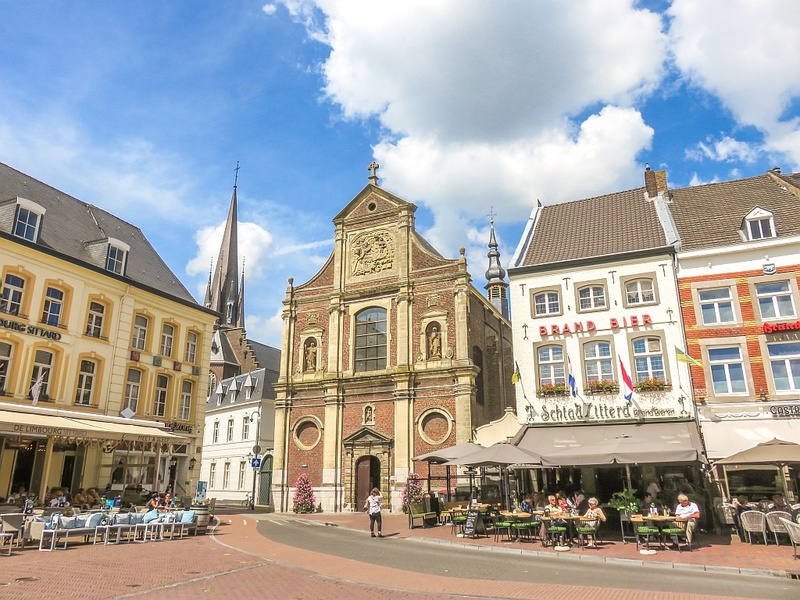 As Limburg is pretty long, some of the places in the north part of the province are at more than 100 km from Maastricht, that’s why I haven’t included them in this selection. I love Limburg with it’s gentle rolling hills, something totally different from the rest of the Netherlands. The more you go to the south, the curvier gets the landscape until you reach the highest point on continental Netherlands – Vaalserberg with its whopping 322,40 m (1,058 ft). Fun fact: The highest mountain in the Netherlands is in the Caribbean territories of the country on the island of Saba – Mount Scenery – 887 m (2,910 ft). The Dutch Province of Limburg shall not be confused with the Belgian Province of Limburg, which is bordering with the Dutch one. These are some of the most beautiful places to visit in Limburg on a day trip from Maastricht. Roermond is a lovely city on the River Meuse at some 50 km from Maastricht. Although it’s mostly known as a shopping destination because of the outlet centre located there, the city has rich historical and cultural heritage. I love to walk around and stop at the market places to take a cup of coffee or a beer and listen to the carillon on the town hall. Another lovely place to hang out is the Munsterplein – the square in front of the beautiful Romanesque Our Lady Minster church (Munsterkerk). In the summer, there are quite regularly concerts held from the cute pavilion on the square. When in Roermond don’t miss also the 15th century St. Christopher Cathedral. If you are there on a Saturday (between April and October), you can climb the church tower for breathtaking views of the city, the river and the surroundings. Sittard is one of the oldest Dutch cities with city rights granted as early as in 1243. I was surprised how beautiful and lively the place was. There are some amazing churches and of course the imposing monastery complex of the Dominican Monastery and the Convent of the Ursuline Sisters. The old town and the city centre are simply adorable. When in Sittard, you should visit the Neo-Gothic Church of Our Lady of the Sacred Heart. It has amazing interior decorations and in my opinion it’s the most beautiful church I have visited in the Netherlands. It was also the first church in the Netherlands that was granted the title ‘basilica minor‘ in 1883. Tip: Do not miss to try the local craft beer in Sittard brewed by the Ambrass Brewery. I especially loved the Zittesje Sjnaak (don’t even try to pronounce it!). You can also visit the brewery and taste their beers. They call Thorn ‘the little white town‘ and for a reason. All houses are painted in white, which is quite unusual for the Netherlands. Besides being irresistibly charming, this place has unusual history. Until the French invasion in 1794, this place was the smallest independent principality within the Holy Roman Empire, run by women. What started in the 10th century as family chapel, grew into an abbey where powerful women from the nobility were running their own miniature state. Today, there isn’t much left from the abbey itself, but the church still stands there and can be visited. I highly recommend a visit to the local museum where you can learn all the amazing details about this place. Another beautiful place to visit in Thorn is the Chapel Under the Linden with its rich Baroque interior. Stevensweert is a tiny fortified town located on an island created by the Meuse River. In I633 (during the 80-Years’ War) the Spanish turned the small place into a fort, creating 7 bastions and 5 ravelins. If seen from the air, once Stevensweert would have looked like a star. Today, a part of the fortifications is restored and you can walk on the bulwarks. All streets in the town lead to the centre like spikes in a wheel. There’s even a stone in the middle of the street indicating the centre of the town. Once there was also a castle in Stevensweert, but today there are only ruins remaining attached to a house. In the 1980s the town has been beautifully restored and since 1993 it has been declared a national monument. Tip: There is a boat service between Thorn and Stevensweert. Isn’t that just a perfect opportunity for a day trip? Start your day at Stevensweert, then take the boat to Thorn, have a great time there and go back by boat to Stevensweert. If you have some time left, you can stop at Wessem, which is also a lovely place. Valkenburg is super close to Maastricht and is perhaps the most popular day trip from the city. Besides, there are so many things to do and see there! Valkenburg looks different from the rest of the Dutch cities and you will notice it immediately. You’ll hardly find there the typical Dutch houses covered with decorative red bricks, but instead, the houses there have this sand-whitish colour. It’s because there were marl stone quarries in the region. As a result, today there is network of caves which are open for visitors. You can visit the Municipal Cave (Gemeentegroot) and the Velvet Cave (Fluwelengroot). Valkenburg boasts the only castle built on a hill and the only outdoor cableway in the Netherlands. Enough reasons to visit the place, or not? Oh, and if you are travelling with your kids they will love De Valkenier – the local amusement park. Tip: Are you up to an unusual Christmas market? Each year there’s a Christmas market held in the caves under Valkenburg. This little village is just a few kilometers away from Valkenburg. The village itself isn’t that special, but there are two walking trails in the neighbourhood that aren’t to be missed. One goes along the Geul River and the other one along the gentle hills. Both trails lead to Valkenburg but my recommendation would be to make a round trip, starting from Schin op Geul, walking one of the trails heading to the castles and taking the other trail back to the village. The Schaloen Castle is absolutely stunning! It has a lovely garden and a restaurant, so you can stop there for a bite. Then visit the Castle Gardens of Oud Valkenburg with the water mill and head to Genhoes Castle afterwards. Unfortunately, both castles aren’t open for visitors, but you will have a lovely day exploring the pastoral beauty of Limburg! Brunssummerheide is a nature preserve to the south of Brunssum. The name of the park can be translated as Brunssum’s Heathlands. The landscape is quite diverse – hilly sand dunes, peat bogs, pine forests, a brook crossing the park and of course vast areas covered with heath. They say, the park turns into purple magic in the autumn when the heath is in bloom. I have visited it in the spring and the place was still incredibly beautiful. There’s a visitor centre in the park where you can take a map of the park with different trails to choose from. De Meinweg is one of the 20 National Parks in the Netherlands and it comes without saying that it’s the perfect day trip in Limburg for nature lovers. This park is characterized by terraced landscape with steep transitions between the plateaus. You can walk there through forests, marshlands and lakes. There’s also this lovely trail that goes along a boardwalk through a flooded forest. As there are so many walking routes to chose from, one day is not enough to explore the whole park, but you can still get an idea of it. Just pick up one trail and get completely off-grid. (There’s hardly any mobile reception in the area). As the National Park is located at the border with Germany, you might just pop up there without noticing it. If you want to climb the highest mountain in the Netherlands, this is your chance! OK, it’s only the highest one on continental Netherlands, and it’s not a mountain but a hill. Psst… Just don’t tell this to the Dutch, as they don’t know it yet. They are convinced it’s a mountain. Also at this place there come together the borders of the Netherlands, Belgium and Germany. There are two watchtowers: the 35-m high Wilhelminatoren in the Dutch part which also has a skywalk, and the the taller, 50-m high Bodewijntoren in the Belgian part. There’s also a lovely maize near the tripoint. Visiting Maastricht? Pin these ideas for a day trip from Maastricht! I would love to visit that castle, even if I couldn’t tour the interior. It’s absolutely beautiful!